You and I both know how hard it is to make money in the stock and property markets and that's not about to change for some time. That's why you might be scrambling to find an investment opportunity that can put your Super Fund and savings back on track. In fact, if you're like most Australian investors, your Super Fund and savings balance went DOWN 20 to 40% during the Global Financial Crisis (GFC). The scariest things about the GFC is the fact that investors were powerless to prevent it and once caught up in it, had no control whatsoever. Most lost two years of returns practically overnight. Let's face it - that hurts. But guess what? There's something you can do about it. It's called Virtual Real Estate. Buying and selling websites on the Internet. The Wealth Without Worries Investor Briefing is an event designed to explain this wealth creation vehicle that is NOT new, it's just been a well-kept secret until now. In fact during the GFC, when the stock and real estate markets were struggling, the second Virtual Real Estate Portfolio Development Excelsior II completely sold out! 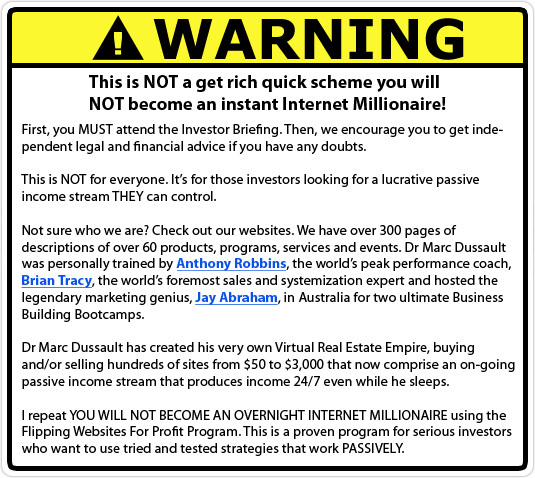 You'll get comprehensive step-by-step instructions to turn you into a ‘Virtual’ Property Mogul – even if you have ZERO investment or online experience. You’ll understand the process of sniffing out what we call ‘Krappy’ websites, plus you’ll receive complete 'tick-the-box' checklists of powerful optimisation strategies to quickly and easily improve the cash-flow and asset value of each website on a shoestring budget so you can flip it for maximum profits. Why isn�t everyone doing this? From Krappy to Kool to Kash Kow Websites... Ka-Ching! At the Wealth Without Worries Event, you'll learn about the two components of successful Virtual Real Estate investing. OPTIMISING: Improving the cash flow and asset value of your portfolio websites. This model is such a ‘no brainer’ that SMART investors are starting to realise its enormous upside potential. And because we’ve done all the ‘dirty work’ for you – you can get started RIGHT NOW! Krappy Websites are basic, simple sites that have been created by someone passionate about the subject, but with no clue about optimising the site for traffic generation. These sites are not bought and sold on revenue generation capabilities, but FREE organic traffic potential. They are the quintessential ‘fixer uppers’. To be flipped to people who can turn them into Kool websites. Kool Websites are better than Krappy Sites with an established traffic base and/or sufficient content to be easily and quickly transformed into a Kash Kow Website. Kool Websites require specific renovations to be made which requires a higher skill set than flipping Krappy Websites. Revenue still does not play a significant factor in evaluating and assessing Kool Websites. Kash Kow Websites by definition are revenue producing, passive income generating and as such need to be given a substantial facelift or massive makeover to produce profitable returns. This requires the highest skill set, but also has the potentially highest rewards – producing on-going passive income 24/7/365. You’d have to be a FOOL to BUILD a website from scratch – when all the ‘grunt work’ has already been done for you! By acquiring established websites, you eliminate the expensive and time-consuming process of identifying and testing potential niches – this alone could save you thousands of dollars and 10 to 50 hours of research that someone else has done for you! Many established websites can be purchased for as little as 10 to 20 months’ revenue. The cost of entry is ridiculously low. Many established websites are available for purchase at a ROCK-BOTTOM $400-$2,000 - compare that with purchasing a ‘brick and mortar’ business. Most existing online businesses are so poorly SEO optimised that you can increase cash flow and asset value quickly and easily, especially once you learn the paint-by-numbers simple optimisation strategies that will be revealed at the Wealth Without Worries Event. It’s BECAUSE someone has NOT been successful in a particular niche that you will pay 10 cents on the dollar to make it successful. We will show you exactly how to identify the ‘Krappiest’ sites with the most upside potential. A little confused? Don’t be, we’ll explain it all to you at the Investor Briefing. How does this compare to traditional investments like the Stock Market or Property Investment? In the Wealth Without Worries Event, you’ll discover how to acquire income-generating websites that you can either leverage for cash flow or optimise and sell for a handsome 50% to 100% profit, within hours and days. ...You’ll learn how to buy websites that funnel targeted prospects into your own brick and mortar business website. This strategy has worked for plumbers, electricians, dentists, lawyers, retail shops. The key here is that these are leads that start coming to you automatically and systematically. Every day, every week, every month. How much are you spending right now trying to acquire new leads? How long is it taking you to find them? Wouldn’t that change things for you just a little bit? What if the online revenue you generated payed for all of the maintenance costs... How exponential would that be? A continuous stream of FREE LEADS for your brick and mortar business! Due diligence checklist – you get a ‘tick-the-boxes’ checklist for assessing the upside opportunities and downside threats BEFORE you even consider purchasing a website. Which websites you should hold for cash flow and which ones you should sell for a quick profit. How to CONTROL your risk in the “Virtual World ” – things you MUST KNOW so you don’t get taken to the cleaners by unscrupulous website sellers. (You’ll learn how to spot such ‘bombs’ so you don’t have to learn the hard way). Simple strategies to increase revenue, profit, growth and asset value that are proven to work on ANY website in ANY market. 32 Traffic Optimisation Strategies – TOP 32 exponential strategies guaranteed to surge hoards of fresh traffic to your new Virtual Real Estate websites on a shoestring budget– many taking less than 5 minutes! 32 Traffic Monetisation Strategies – 32 PROVEN ways for increasing visitor value – turning curious visitors into excited buyers who are eager to give you their money around the clock, even while you sleep. PLUS additional bonuses, tips and techniques! We’ll teach you how to bullet-proof your portfolio so the instant you buy a web property, you deploy 3, 4 or 5 strategies to INSTANTLY protect it’s capital asset value to reduce or eliminate any downside risk. or Investor in the next 2 minutes! The Wealth Without Worries Event will provide you with an overview of a complete step-by-step process to take you from a complete newbie to a serious investor so you can generate passive income streams by flipping existing websites for maximum profits anytime you feel like it, as often as you want. ...or you could do a quick ‘renovation’ job by following a simple step-by-step process for a 400-500% profit in a matter of weeks. The exciting thing is not the dollar values involved – it’s acquiring the skill set and the confidence that you can repeat this profitable process over and over and over again – anytime you want a little extra cash! Now that’s the ultimate freedom – having the ability to generate passive income streams that you can manage from your home, local park, the beach or anywhere else you like, that pays you even while you sleep! You can’t and won’t find this information anywhere else on the Internet because, quite simply, it doesn’t exist. You can only get it from this website right now and the longer you wait, and the more people learn about this model, the less easy it will become to make the high returns that are currently possible. You know how important timing is. The earlier you are able to get in, the higher the returns. There are many passionate people who spend a fortune building, researching and writing content for their websites – their websites are fully functional. They do it as a hobby, out of fervent passion. They don’t know any better, and they certainly don’t know exponential strategies to take those websites to the next level. But that’s exactly what you’ll learn at the Wealth Without Worries Investor Briefing. You can start small with as little as $200 “seed capital ” and use the optimisation strategies introduced at the Investor Briefing to boost your cash flow and parlay your profits into more web properties. It’s totally up to you how much money you want to be making. Wouldn’t you agree there is nothing better than to make money while having fun – money that never stops flowing into your bank account? ...You’ll learn how you can access just about any professional to tweak your websites, research, compile and write sales copy or execute any other technical wizardry for you at 10 to 20 cents on the dollar! Frankly it’s the best business you could ever have. You set your own hours, you determine how much you want to earn – you are the master of your destiny and you can get started right now! This is an on-going, passive income stream that you build month-by-month to augment and then to replace your employment/professional/effort-based income with REAL PASSIVE income that keeps flowing into your bank account even while you sleep WITHOUT lifting a finger! But I must warn you, your only advantage right now is the "first-mover" advantage, as the more people discover this powerful model, the less effective it becomes. Just like any investing opportunity, your TIMING determines your success. Imagine if you could build 10 or more income-generating websites that just keep pumping profits into your bank account, day-in, day out. Stop imagining. Make it a REALITY right now. Decide now to attend the Investor Briefing and determine then if this is for you. There's even a FREE Option, so price isn't a factor -- desire is. Your Super Fund and savings are going to continue to languish if YOU don’t get control of your finances and wealth creation back soon. Time is money. Last year, the development SOLD OUT. Don’t get left behind this year. 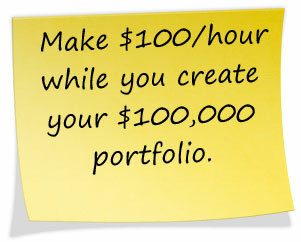 How much would you have to invest in the Stock Market to make $1,000/month of NET INCOME? At a 5% dividend/yield rate, it would be $240,000. In ‘Real World’ Real Estate it would be $1,000,000 to $2,000,000+ for a NET positively geared property depending on interest rates and rental returns. Do you have a better way of making on-going passive income than what I have described? With this Virtual Real Estate strategy, you will quickly get to $1,000/month of income on your way to learning how to get to $100,000/year. To be crystal clear about the passive nature of this income – business people and Internet entrepreneurs are replacing their effort-based income with this auto-pilot income so they can finally get out of the entrepreneurship jail that enslaves so many hard-working professionals. They’ve come to the realisation that 5 to 10 hours/week is passive and with $1,000 to $10,000/month of income it’s the best wealth creation opportunity available, especially in this recession. Still wondering if this is for real? Let me tell you the TWO genius concepts that make this an absolute no-brainer. Genius Concept #1: You control how you create Income or Capital gains. That’s right, you can buy one website that you flip for a 100% or 200% capital gain and buy another one that you’ll create an opt-in strategy with an on-going back-end sales income of $5 or $10/opt-in that produces $500 or $1,000/month of income. Genius Concept #2: The revenues produced via Virtual Real Estate are not limited to online sales! What does that mean? Let’s look at an example that assumes that you own 20 health related sites that each has 1,000 unique visitors per month. That is 20,000/month or 240,000/year. If you had a 1% of the visitors opt-in to be contacted by a local Chiropractor for example, that would be 2,400 suspects or prospects. I told you it was GENIUS! Of course if you’re a genius, you’ve figured out that you can repeat this strategy with Chiropractors in other states and countries… Ka-Ching, Ka-Ching, Ka-Ching! But y’see, this is where it gets EXPONENTIAL. Do you want to make money 24 hours a day, 7 days a week, even while you sleep? Do you want to learn the latest and greatest Exponential Internet Marketing Strategies amongst a MasterMind of other like-minded people who are just as committed and excited about this concept? Do you want to get beyond working hard for your money and start to get it to work hard for you instead? Do you want to make money without having to SELL anything? Most ‘biz opps’ and MLM models rely on your personal network of friends and family – this doesn’t. No one needs to know how you’re making $1,000, $3,000 or $10,000/month. If you have a friend, brother, sister, niece, nephew, wife or husband that can help you, you’ll be joining others who have teamed up to make this a family affair - BUT YOU DON’T HAVE TO most are doing this on their own – quietly and privately. No one knows how they can afford that new watch, suit, dress, car or exotic vacation. That’s their little secret! Please note that the Wealth Without Worries Investor Briefing is NOT a presentation for a financial service, product or investment. The presenter will not be giving investment, financial or tax advice as defined by the Financial Services Regulations. All participants are expected and encouraged to seek their own independent advice and counsel should they choose to enrol in the proposed Internet-based program called Flipping Websites For Profit. As an Internet-based model that has produced incredible results for people in the past, there is no guarantee these will be replicated in the future. Your results and returns will vary based on what you do and don’t do with the program curriculum content. All the details of the program will be explained at the Investor Briefing event so that you can make an informed decision. That is why the Investor Briefing is taking place – to ensure you have all the information and details you need to make the right decision. Only 20 to 30 people will be admitted into the program – people who want to buck the trend of the current downward spiral and invest in themselves as the creators of their own wealth – something they can completely control instead of leaving it up to others to determine their fate and their financial destiny. Having an Exponential Mindset means realising that the previous disclaimer is necessary but does not preclude someone with a mind open to boundless possibilities to discover and assess such an exciting opportunity. We all know that we get what we deserve in life – when we leave it up to others to manage our finances and they get it wrong, we deserve to suffer the 25, 30 or even 45% drop in our superfund balances. An exponentially minded person however has the option – to explore other avenues of wealth creation. Out-of-the-ordinary ones that can produce extra-ordinary results. An Exponential Mindset enthusiast can extrapolate what it can mean to fully leverage the Internet – a global audience that is online 24 hours a day, 7 days a week. Leveraging that to create a passive income stream is not just exciting – it’s real. People of all walks of life are doing it. This particular model, that will be presented at the Wealth Without Worries Investor Briefing is a unique twist that will without a doubt excite you. As stated in the previous paragraph, you MUST make sure this is for you and that you do get all the independent and relevant advice from your trusted professionals. Most will discourage you because they don’t understand the model or they have a vested interest in keeping you locked in the ‘old school’ model. If that happens, this is NOT for you. Remember, there are only 20 to 30 spots available anyway – with more or less 20 million Australians, that’s about one in a million... Literally. So if you have any doubts, Wealth Without Worries and Flipping Websites For Profit is not for you. This is a very different way of looking at wealth creation – just like entrepreneurs go into business to build a business that someone will buy one day, this is no different – except that implemented properly, there is no ‘office, store or factory’ to go to. It’s all virtual on the Internet!